1.Chinese Venture Funding is 15x 2013 Levels….2017 Saw Almost Equal Funding to U.S.
Silicon Valley, long the undisputed king of venture capital, is now sharing its throne with Asia. A decade ago, nearly three-quarters of the world’s financing of innovative, tech-heavy startups and young companies took place in the U.S., with American investors plowing money into mostly U.S.-based venture firms. 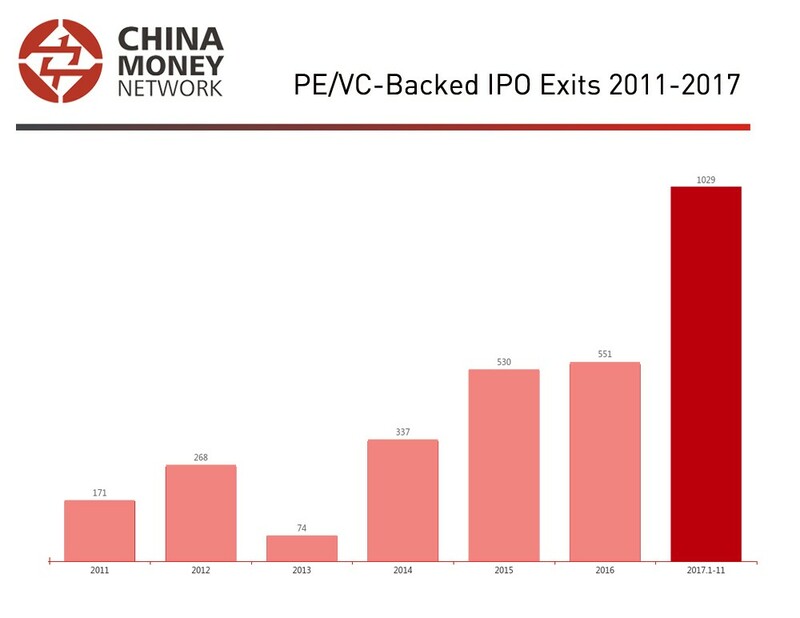 Now, a surge of new money—mostly from China—has helped drive funding totals into the stratosphere and has transformed the venture landscape, according to an exclusive Wall Street Journal analysis of venture funding data. 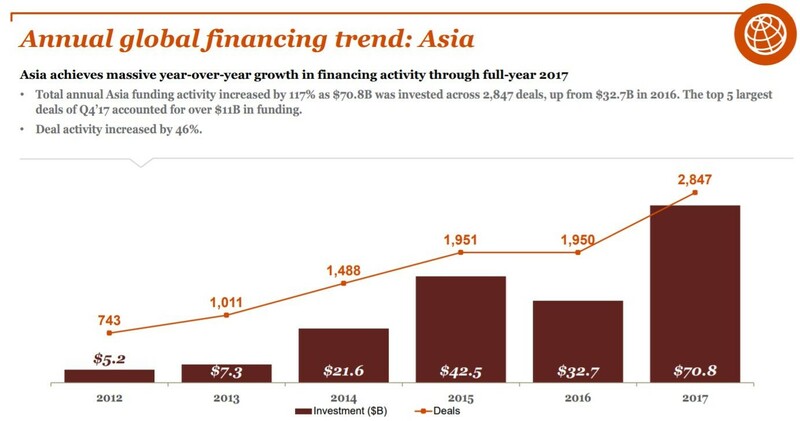 Asian investors directed nearly as much money into startups last year as American investors did—40% of the record $154 billion in global venture financing versus 44%, the Journal’s analysis of data from private markets data tracker Dow Jones VentureSource found. Asia’s share is up from less than 5% just 10 years ago. 2.How Do Factors Perform During Equity Market Sell-Offs? This factor performance during market sell offs is consistent with historical trends. 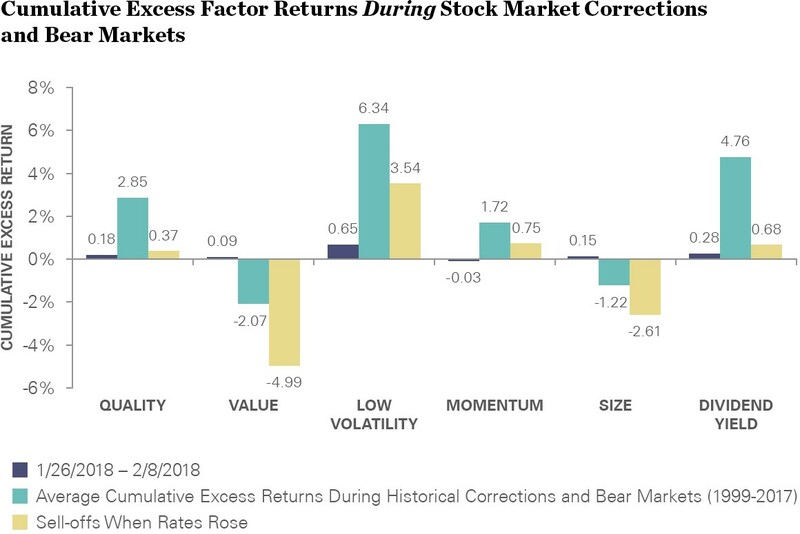 The chart below shows how defensive factors (such as low volatility, dividend yield and quality) performed better than more risk-on factors during corrections or bear markets. However, if we look at corrections in a rising interest rate environment (the beige bar in the following chart), the outperformance of defensive factors was less significant, meaning they provided less of a cushion to investors during market corrections that featured rising yields. 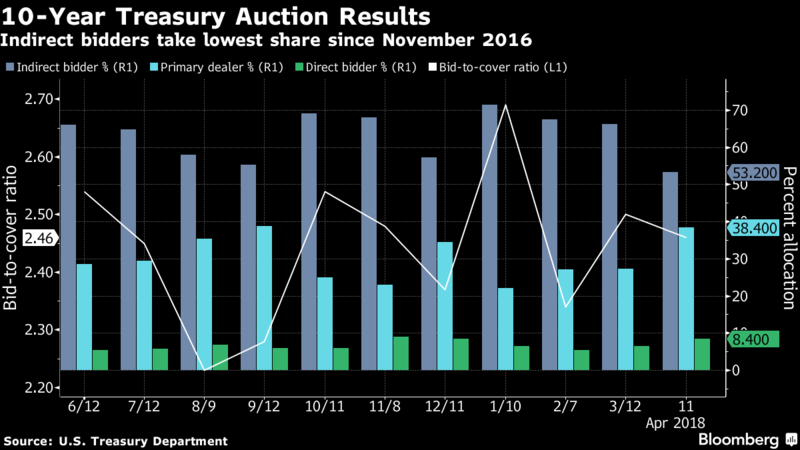 For the U.S. to borrow cheaply as it boosts borrowing, it’s going to need overseas investors to step up at its debt auctions. The early indication from this week’s $64 billion slate is that those buyers may be turning skittish. Bond traders have been keenly focused on who’s participating this year because the market is in an unusual situation: the Federal Reserve is raising rates at the same time that the nation’s budget deficit is widening. Without persistent demand from some of the biggest holders of America’s debt, borrowing costs are likely to climb — meaning investors will see bond prices decline. ‘Strange Bedfellows’“The growing U.S. deficit coupled with protectionism are very strange bedfellows,” said Andrea DiCenso, a portfolio manager at Loomis Sayles & Co.A higher deficit forecast “only shows all market participants that we are going to continue to be reliant on foreign investors to participate in our debt markets,” she said. Yet with the Trump administration mulling tariffs, “at what point does that spook the foreign investors in our market? 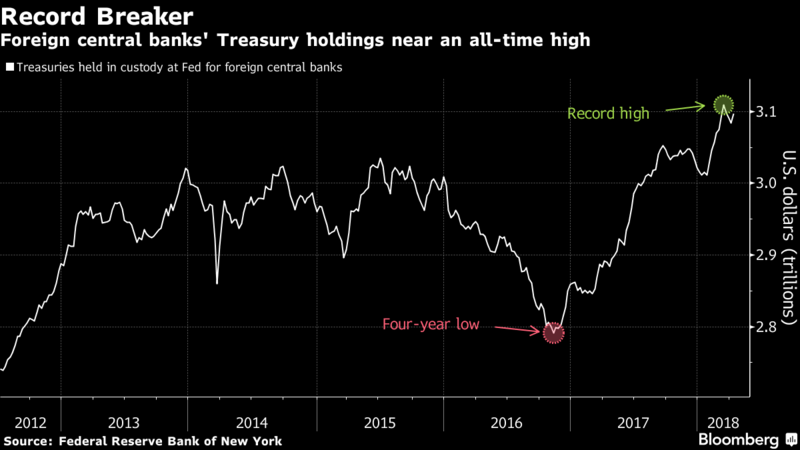 How much do foreign investors put up with” before demanding higher yields, she said.DiCenso, who’s also a senior strategist in Loomis’s alpha strategies group, says she regularly speaks with the firm’s Treasury desk about money flows, particularly around auctions. Any sign that demand is no longer robust for U.S. debt could reverberate across asset classes, she said. For now, foreign central banks appear content to own Treasuries. The amount of U.S. government bills, notes and bonds held in custody at the New York Fed rose in the week through April 11, after declining three straight weeks from a record $3.1 trillion. That peak in March coincided with a long-bond auction that indicated plenty of appetite from abroad. Treasury figures show foreign and international investors purchased 19 percent of the U.S.’s $13 billion 30-year bond sale last month, their largest share since 2015. That likely helped the issue draw a yield below what was indicatedbefore the offering.So far, the fluctuations in demand have had limited repercussions. The benchmark 10-year note yields about 2.83 percent, around the average since the start of February. But in the face of escalating tension between the U.S. and Russia over Syria, trade friction with China, consensus inflation and a mediocre American labor report — all of which should support bond bulls — the question of who’s going to absorb a burgeoning supply of U.S. debt remains a key reason keeping yields range-bound. 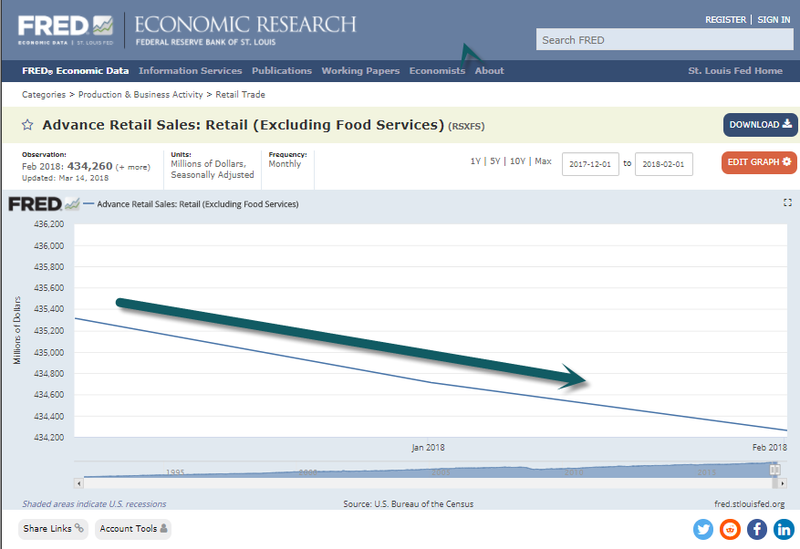 4.Retail Sales Fell the Last 3 Months. For the past three months, however, retail sales have fallen, something that has happened only five times outside recessions, according to the Liscio Report. 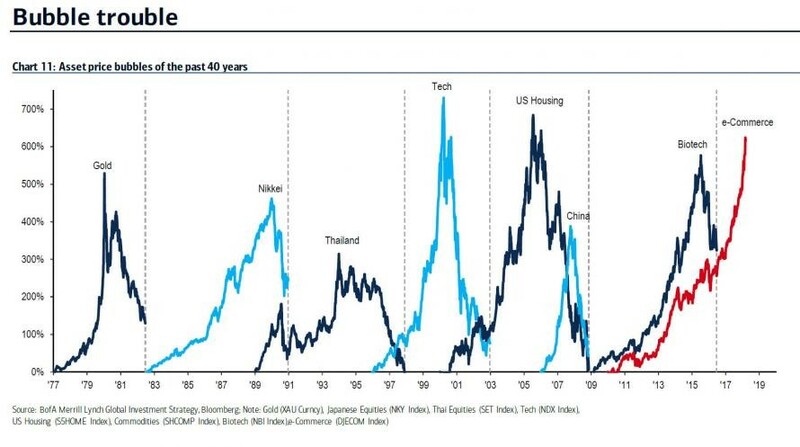 “As we all know far too well, this is a very noisy series, but any way you look at the trends, they are weakening,” the newsletter’s client note says. That’s even after taking out lumpy automobile and gasoline sales, which largely reflect price changes. 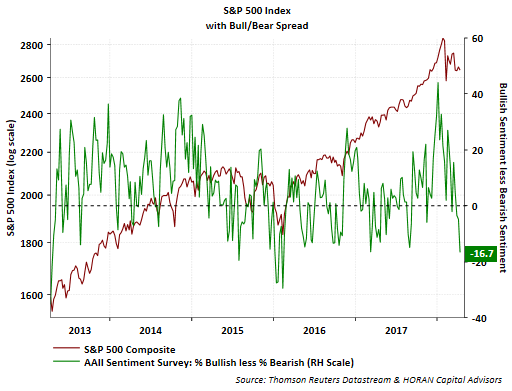 6.Retail Sentiment Bearish….AAII Survey Negative…Fear and Greed Index at “extreme fear”…Contra Indicators. The AAII survey is often used as a contrarian indicator, meaning traders turn upbeat when its readings get gloomier. And that’s what the numbers just did. One respondent griped to AAII about “too much uncertainty coming from the White House” amid high equity valuations. 7.Full Employment? Small Biz Owners Biggest Problem Finding Quality Employees. 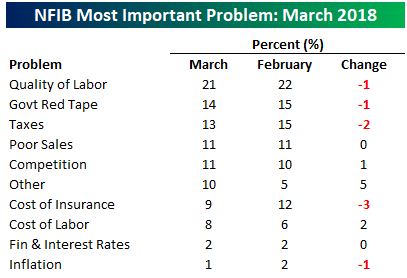 Bespoke notes the biggest headaches of Small Biz Owners – taxes hitting the lowest concern since 1982, while Quality+Cost of Labor at 10Y+ highs! 8.A Record Number of Republicans Will Not Seek Re-Election at MidTerm Polls. 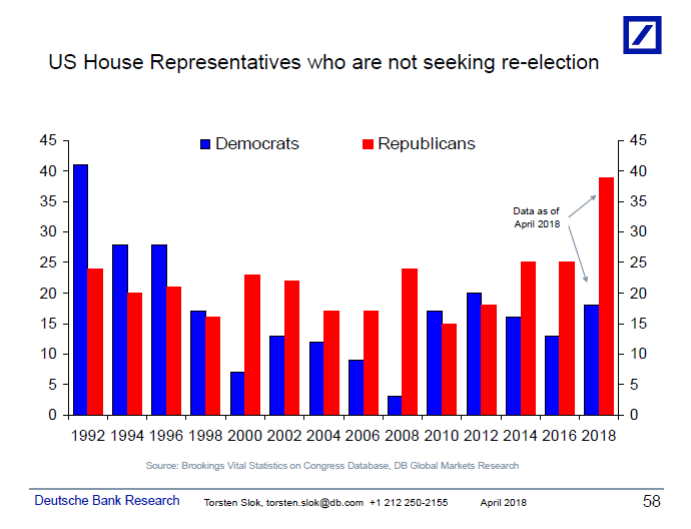 US midterm elections come up more and more frequently in my client conversations, and the latest data shows that a record number of Republicans and an elevated number of Democrats are not seeking re-election in November, see chart below. Ben Carlson is Director of Institutional Asset Management at RWM. His explanation of the differences between bonds and bond funds is required reading for investors. Enjoy. I don’t want to be caught owning bond funds in a rising rate environment. It’s much safer to own individual bonds and simply hold them to maturity. That way I am assured of getting my principal back and not taking any losses. Sound familiar? I always find it fascinating when investors assume they can completely avoid risk in their portfolio without any ramifications. In this case, the individual bond advocates miss out on a few key points. Bond funds are just portfolios of bonds marked to market every day. How can they be worse than the sum of what they own? The option to hold a bond to maturity and “get your money back” (let’s assume no default risk, you know, like we used to assume for US government bonds) is, apparently, greatly valued by many but is in reality valueless. The day interest rates go up, individual bonds fall in value just like the bond fund. By holding the bonds to maturity, you will indeed get your principal back, but in an environment with higher interest rates and inflation, those same nominal dollars will be worth less. The excitement about getting your nominal dollars back eludes me. But getting your dollars back at maturity isn’t even the real issue. Individual bond prices are published in the same newspapers that publish bond fund prices, although many don’t seem to know that. If you own the bond fund that fell in value, you can sell it right after the fall and still buy the portfolio of individual bonds some say you should have owned to begin with (which, again, also fell in value!). Then, if you really want, you can still hold these individual bonds to maturity and get your irrelevant nominal dollars back. It’s just the same thing. Risk never completely goes away. You’re still dealing with all of the same bond risks as every other investor when you buy individual bonds — interest rate risk, credit risk, inflation risk, duration risk, default risk, etc. It’s just a form of mental accounting to assume that you’ll be able to ignore short-term losses in individual bonds with the knowledge that the principle value will be there at maturity. To which my response is this — if you’re willing to ignore short-term losses in individual bonds, why can’t you ignore short-term losses in bond funds? Costs and complexity. Buying an individual bond is not exactly a walk in the park. For the most part, they’re illiquid. The costs are much higher to trade. Most of the cost you’ll never be able to quantify because you won’t be able to tell if you’re getting a good deal on your trade or not if you’re not an expert. The spreads tend to be much higher on bond trades than what you see on stocks. You also have to research and understand which types of individual bonds you will be buying. When income payments are made you have to figure out where to reinvest the proceeds. Then you have to figure out what to do with your proceeds all over again when the bond matures. When do you need the money? Really the only reason that owning an individual bond would make sense is if you needed that amount of money on a specific date. Let’s say you know you need this money in exactly five years for your child’s college education bills.. Sure, maybe then owning an individual bond might make sense. But bond funds are much easier to deal with if you’re slowly accumulating wealth or slowly taking distributions from your portfolio over time. Most people who own individual bonds probably reinvest their principal right back into new bonds, which is exactly what bond funds do. Diversification. Not only do you diversify your holdings by owning a bond fund, which severely reduces default risk, but you also diversify your cash flow stream. Think of a bond fund like something of a perpetual dollar cost averaging vehicle. In a bond fund you have bonds with different maturities, yields and durations. 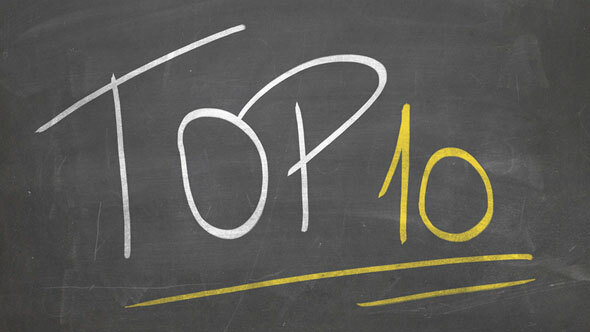 Most funds hold thousands of bonds so the individual holdings are constantly maturing. This allows bond fund managers to reinvest maturing bond proceeds into the new market interest rates. When rates rise, this is a huge plus for bond funds because they can continuously reinvest at higher rates, which offsets some of the sting you get from the price decline. Yes, you have a maturity date with an individual bond, but this ignores the opportunity cost of investing at higher future rates in the meantime. I’m all for investors doing whatever they need to do to meet their goals and sleep soundly at night while doing just that. Maybe individual bonds can give some people the peace of mind they need. But I think there are a lot of misconceptions about the differences between individual bonds and bond funds. Investing in individual bonds does not shelter you from risk. Bond funds have risks too, but you may be taking unintended or unnecessary risks by investing in individual bonds if you don’t understand how these things work. B.H. Lidell Hart spent a lifetime writing about the history of military strategy and war. He summarized the many lessons in his writings in a little book called Why Don’t We Learn from History?. The book is meant as a summary of the history of warfare, but it’s much more than that. It’s easily translatable to lessons on life, business, and investing. Only Hart presents it with an inverted view of the repeated mistakes of history deeply rooted in human nature. History can show us what to avoid, even if it does not teach us what to do — by showing the most common mistakes that mankind is apt to make and to repeat. History is the record of man’s steps and slips. It shows us that the steps have been slow and slight; the slips, quick and abounding. It provides us with the opportunity to profit by the stumbles and tumbles of our forerunners. This never gets old. Learning what not to do is a huge advantage in investing. The value of history is in the countless repeated ways people screw up. If we bother to study the screw ups there’s a hope that we avoid making the same mistake twice. The unique thing about studying history is the immediate lesson that there’s nothing unique about “tough times.” History is filled with how things went wrong, mistakes were made, and people recovered. The lesson: there’s no reason to panic, it’s temporary. Direct experience is inherently too limited to form an adequate foundation either for theory or for application. At the best it produces an atmosphere that is of value in drying and hardening the structure of thought. The greater value of indirect experience lies in its greater variety and extent. “History is universal experience” — the experience not of another but of many others under manifold conditions. This has everything to do with learning as effectively as possible. Nothing is a better teacher than feeling the pain points personally. If it hurts, you’ll never forget it. Except, first-hand losses are a great, but inefficient teacher. Markets rarely offer a crash course education. Direct experience takes time, over many market cycles. And because each cycle is different, the lessons learned from one, may not be helpful in the next. Indirect experience is the most efficient, least costly way to learn. Because mistakes are our greatest teacher, learning from someone else’s is always better for your portfolio. So, if you’re a long-term investor, you should have ample free time to read, learn, and practice your skills while you patiently sit around and wait to experience it first-hand. A sound rule of historical evidence is that while assertions should be treated with critical doubt, admissions are likely to be reliable. If there is one saying that embodies a general truth it is “No man is condemned save out of his own mouth.” By applying this test we can go a long way toward a clear verdict on history and on history in the making. Investing is like social media — the wonderful things that happen to us get shared the most. It allows us to present an extremely filtered view of our reality. Everybody loves to talk about the investments they made a killing on. Few people talk about their worst losses. It paints a false picture of performance. All of us do foolish things — but the wiser realize what they do. The most dangerous error is failure to recognize our own tendency to error. That failure is a common affliction of authority. The wise investors humbly admit to stupidity all the time. They know not every investment will work out. They know losses are part of the process. They know luck plays a role. They understand where their abilities end. There is something to be said for honest self assessment…and being critical of what you see on social media. The cause of most troubles can be traced to excess; the failure to check them to deficiency; their prevention lies in moderation. This perfectly describes the emotional forces behind every asset bubble ever…and how to avoid it. It equally explains common personal finance problems around spending, debt, and investing. The same is true for balancing time between work, life, etc. Too much of one thing creates an imbalance, that creates problems that fester and spread unless it’s brought back into balance. The biggest mistake investors make is believing behavior has little impact on performance. 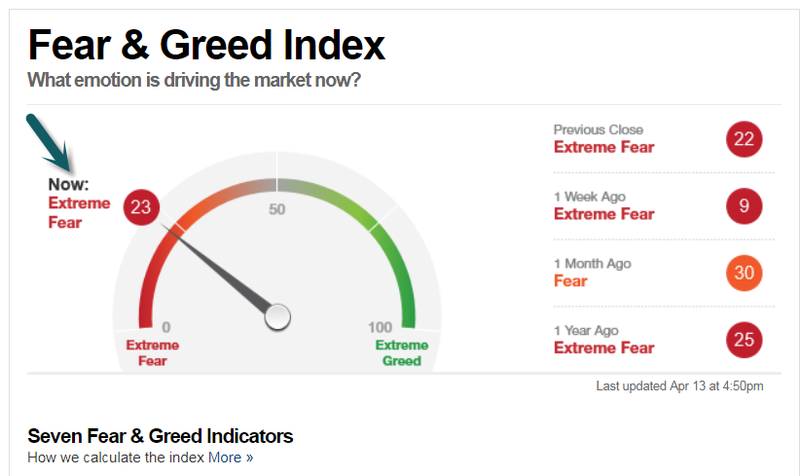 Almost as bad is believing it has little impact on markets. The best-laid strategies produce the worst results if we misbehave. You can be the smartest, most gifted person ever about all things investing, but if you ignore the role human nature plays in investing and the markets, you’ll fall victim to it yourself.